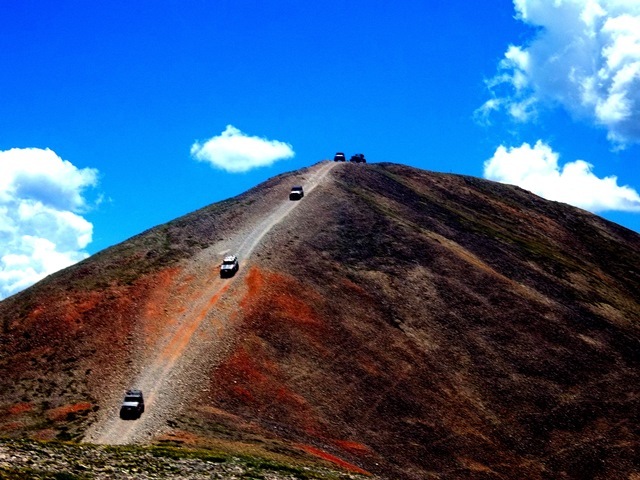 Red Cone is a four-wheel drive trail providing spectacular views of the divide with a few rocky obstacles along the way. 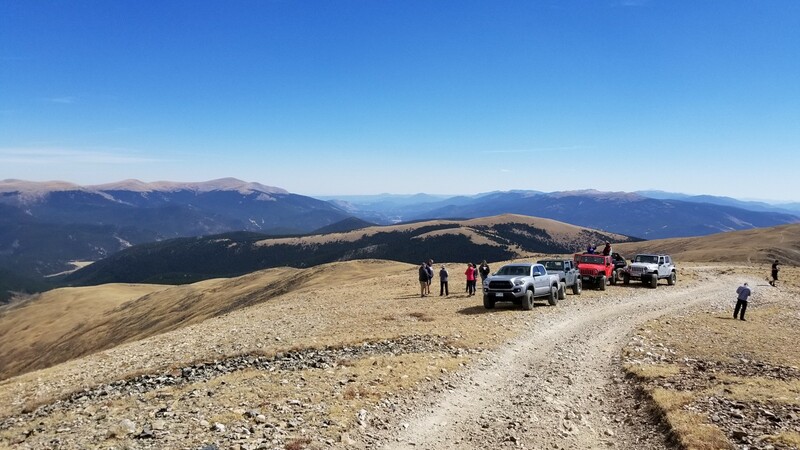 The upper portion traverses the ridge lines around 12,000 feet with views for miles, but it is the extremely steep, one-way descent at the end that will remain in your memory long after the trip is over. Use your lowest gear possible, turn on the AC if you have it to help slow that motor, and use the brakes as little as possible. Do not lock up your brakes. If you feel your back end sliding side-ways, you may have to give the vehicle a little throttle to straighten yourself back out. After about 5 miles on C.R. 60, begin Red Cone at F.S. 565. This intersection is very well marked with signage. Take highway 285 west from Denver. Go about 3 miles past the town of Grant and turn right onto County Road 60. Continue on this main road for 5 miles and avoid all roads that turn left. The trailhead is marked by F.S. 565 on your right, along with a wooden bulletin board with the trail name. 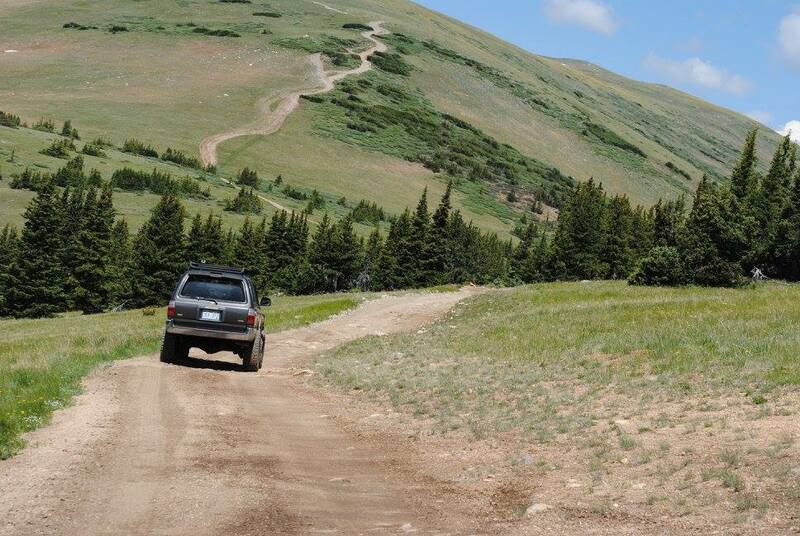 Red Cone is a high alpine trail that begins to see snow in October or November. 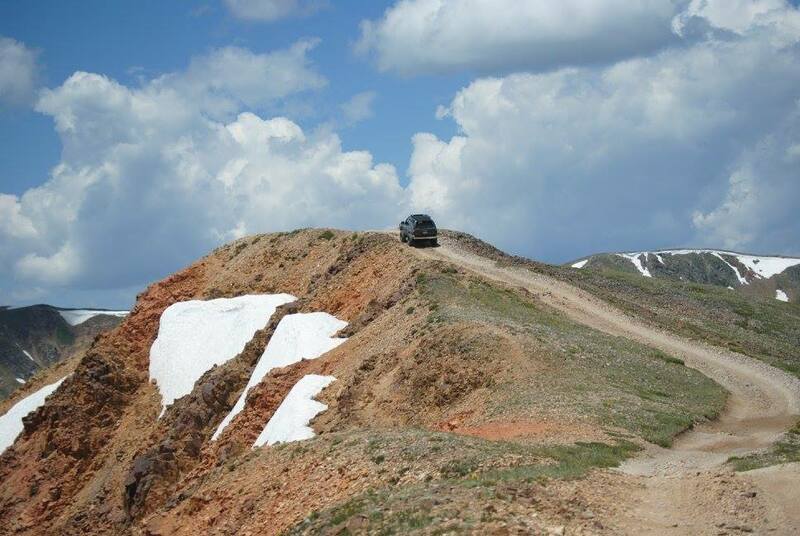 The trail is impassable to 4x4 vehicles during the winter months and should only be traversed by over the snow vehicles. Red Cone is seasonally closed during the Spring run-off season to prevent excess erosion. Exact closing and opening dates can vary from year-to-year depending on conditions, but according to the MVUM it is typically closed April 1st-June 30th. 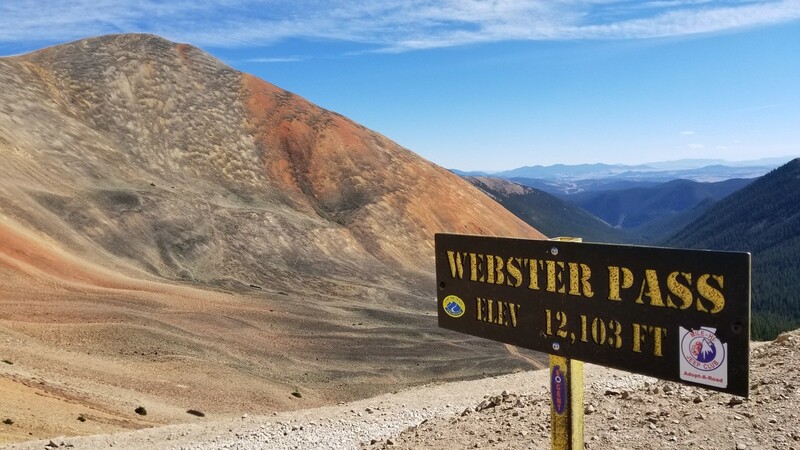 Q: So I understand there is camping off of Webster Pass... We plan on truck camping, very little footprint and setup, do I need to call ahead somewhere and check in or get a pass like other spots? Thanks in advance!!! Q: Will my wrangler with 32" tires make it okay? 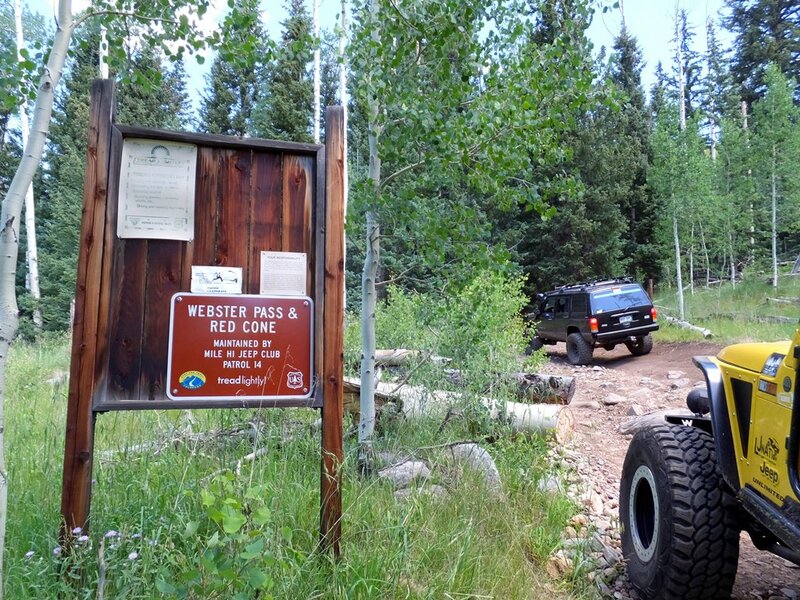 Q: Is red cone and webster pass accessible with RZR. If so when can one park a trailer. I ran Red Cone yesterday with another rig and the ground was dry. There is lots of snow in the forecast this week and I believe we may have been one of the last groups through for the year. Spectacular trail! One of our all time favorites now. Just the right amount of technical. Amazing views. Took Red Cone to West side of Webster Pass and out to Keystone. Highly recommend it. 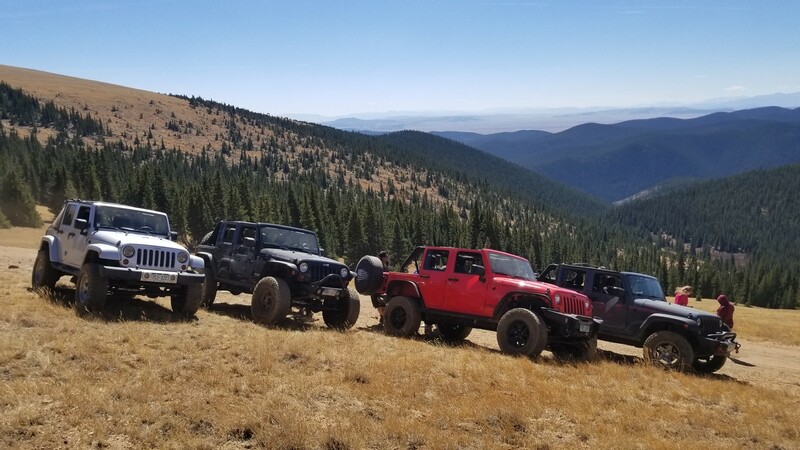 Ran this trail with a group of stock and very modified vehicles. The most stock vehicle we had was an 89 YJ with 30" tires and 1" lift, fully open diffs. Waypoint 2 is much narrower than it seems in the pictures. Our YJ had to be aired down to 8 psi in the rear in order to get traction to get up and over the center rocks. He ended up hitting his rear bumper on the way off but it didn't really show other than a few scratches. If you don't know how to let your engine do the braking on the way down the slopes, don't try this. One of the guys in our group locked his rear brakes up and fish-tailed about 4 feet before letting off, almost got real nasty for him and us. A word of advice don't run the top half of this trail with your sway bar disconnected! We had a few Jeeps (3 - 6" of lift) run without their sway bars and they were puckering as they were coming down. I drove the trail yesterday with my daughter and labrador retriever and had a fabulous time. The reason for writing the review is just to add a word of caution to others that may be driving a somewhat stock older vehicle. I found it to be very difficult. I drive a 1989 FJ62 Toyota Land Cruiser, with a very mild lift (2”) and 31” tires on stock wheels. Fortunately I have a rear diff locker which helped tremendously. I was also loaded pretty heavy with camping gear and a roof-top tent. The first half of the road is very rocky and I just didn’t have enough clearance to progress at a reasonable pace. We had to stop frequently to realign and to move and stack rocks and bolders. The trail description indicated a few hours, but it took us about 5-1/2 hours to reach the top. Of course, to make things interesting, we encountered a hail storm and lighting before reaching the top, so we had to sit in the vehicle for a while and wait for the storm to pass. Fortunately, it did pass pretty quickly. I was a little worried about the downhill parts, given the dire warnings to avoid using the brakes and the fact that my tires are barely larger than stock and don’t have a lot of width. It actually wasn’t bad at all, but I think having the rear locker helped tremendously to keep the tires from skidding. I went very slow, not nearly as fast as shown in on-line videos and I did stand on the brakes pretty heavily. But because I kept the speed so low, I never was actually decelerating, the brakes were used to keep from speeding up. I would have been uncomfortable at a speed where the engine was doing the braking, and yes, I was in 4WD low, with the locker engaged and I have a Vortec V8 instead of the tired old Toyota six. It’s not that scary if you’re careful. What would have been scary for me would be to turn around and go through the rock crawling back the way we came! We continued northward over Webster pass. I also thought that it was interesting that there was NOBODY on the road save for a young couple in a OHV quad. Anyway, tons of fun but just wanted to give a bit of additional perspective if you’re not driving a built-out trail rig. Great day for a trip up Red Cone. It was my 1st run over this pass but we managed it okay. I think the hardest part of this trail is WP2 but I got over it. The decent down was not as bad as I was thinking it was going to be. Not much done to my Jeep other than 33's and a 2.5" lift. I would say traffic was moderate. Got to do this trail on July 1st. Everything was wide open on the trail. Traffic was heavy with Jeeps, Toyota's and atv's (I was driving the only full size K5 seen up there). Trail is tight in the trees for a full size but it is do-able with careful driving. Some corners required a 2 or 3 point turn, but again no damage taken by the trees. Up top was windy, but clear. The climb to the peak had to wait for traffic to clear, but I can't imagine a better place to be stuck waiting for traffic to clear. Once on top the 360 degree view was breathtaking. You could even see the smoke rising from the Weston pass fire to the south. The decent down was fun and spooky at the same time. Gear down, point it straight ahead and pay attention, the Webster summit took no time to get to even creeping down to it. Webster still had the snow cornice at the summit to the south side and it was marked closed at the trailhead below. We returned heading up the valley to the north and hooking up with dear trail and going back up to the top and intersecting with the middle fork of the swan river. We came back to the road at hwy 9 in Breckenridge. 9 took us down back to Fairplay and on to home from there. Great trail to run, if you are afraid of heights it may not be the trail for you. 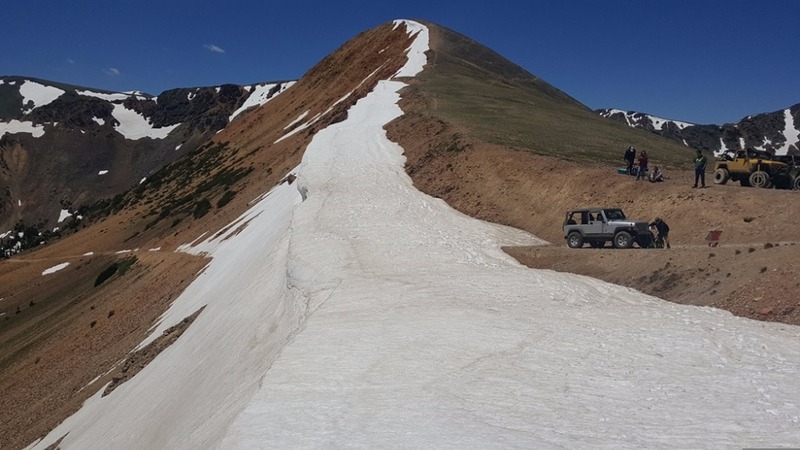 Our friends at Colorado Off Road Enterprise report that Red Cone is open all the way through to Montezuma thanks to Mile-High Jeep Club's efforts. Snow condition update: Multiple reports from this weekend confirm the trail is no longer passable beyond waypoint 5. The seasonal gate does not close till spring, but travel along the trail is not recommended. 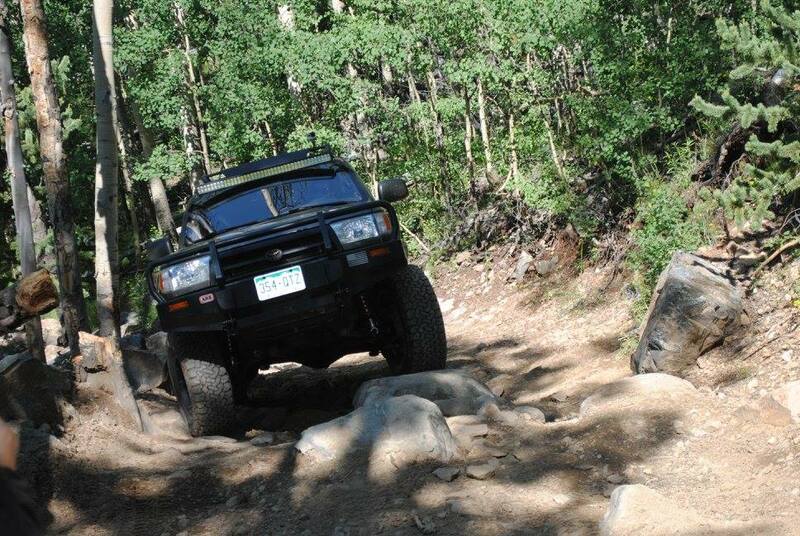 Decided to do Red Cone with my friend Brian in my 1986 Toyota 4Runner. The trail was wet, and there was a good bit of snow as we got higher. Then it started to snow pretty hard. We hit a really muddy patch on a right hand switchback with big rocks in it. I tried to power through that section and took out my left front turn signal and damaged my fender and bumper pretty good on a tree, coming to an abrupt halt. When I tried to back up, the right rear tire got in a deep pit and the 4Runner started to tip right and backward. The left front tire was several feet in the air. Brian jumped out to take weight off the right side, then jumped on the hood and scrambled to the left front corner. That teetered the truck part of the way to level and got me enough purchase to move a bit and alleviate the impending rollover. A Jeep pulled up (thanks Alex and Ryan). We cobbled together my come along, my chain, their chain, and their tree strap. After some trying we got moving again. However, the right rear tire now had a damaged valve stem and was losing air quickly. Using the original equipment bottle jack was difficult, but we eventually got the spare tire on. We were pretty far up at that point, and it was getting late in the afternoon. I thought it best to turn around because of the sloppy conditions on the trail and the possible (probable) slippery nature of the descent down Red Cone. 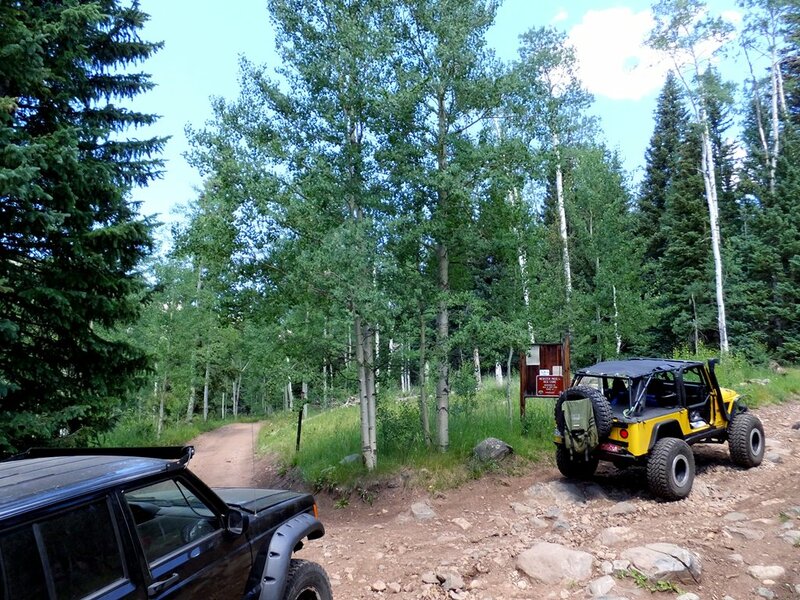 The Jeep guys advised me that in point of time continuing on over Red Cone and back down Webster Pass was probably the same without having to go through the really rutted out boulders that we bottomed out and high centered on a few times coming up. We got to tree line. Their plan was to have us follow them to the top, where they would walk a bit down the descent to see how it was. We watched them slip and slide and get high centered going up the sloppy climb above tree line to the ridge on top and realized we would not make it to the top. They dislodged their Jeep and disappeared over the top. 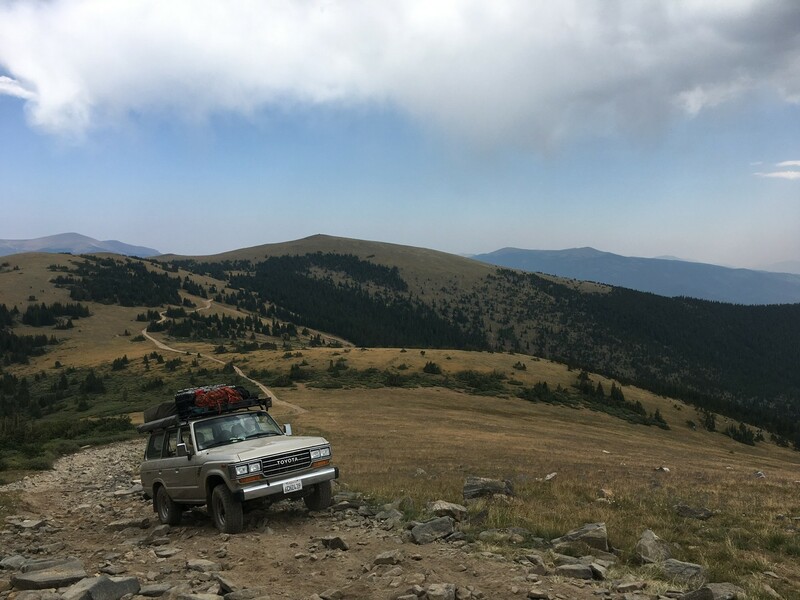 We gave the Jeep about ten minutes and turned around to head back down the way we came up, assuming they decided to continue. It was very windy and cold with snow. Now after sunset and getting dark quickly, we struggled taking the 4Runner back down through rocks that were much more exposed than normal from trail wear during the rain and snow this past week. Eventually the Jeep guys caught up with us coming back downhill. Their story--not ours--was that at the very top there was 6 inches of snow, it was 32°F, and blowing 80 mph. Not sure how they know that last figure, but the passenger said he was unable to open his door against the wind when they got near the edge of the descent. They did show us a video on their phone of the last time they could exit the vehicle nearing the top. 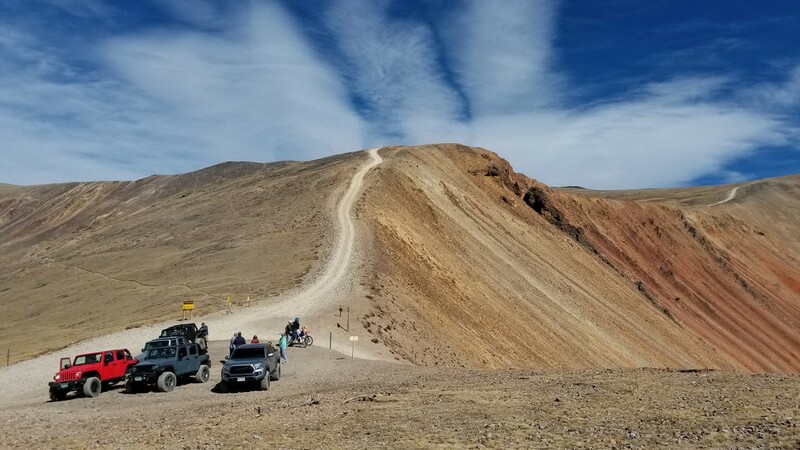 It was clear from the snow depth and blizzard conditions in that video that going down the Red Cone descent had a low probability of successful outcome. On the way back down to 285 my left rear bumper got caught in the mud on a tight canted left hairpin turn. That corner of the bumper slowly twisted itself apart as it acted like a keel or drag anchor guiding me through the turn. It damaged the vehicle, but it did help keep us in the turn. Lessons learned include knowing that the weather is to be respected, stay off sloppy trails, snow and Red Cone do not mix, just because someone else suggests you continue does not make it true, and ego can get your vehicle damaged and endanger your life. That seems like enough lessons for one day. Damage report includes left front bumper, left rear bumper, left front fender, left front turn signal, one tire off the bead, a new squeal/whistle possibly from the differential, and unknown damage to the bottom of the vehicle from rock impacts. In all, a pretty fun day that turned out a lot better than it could have. 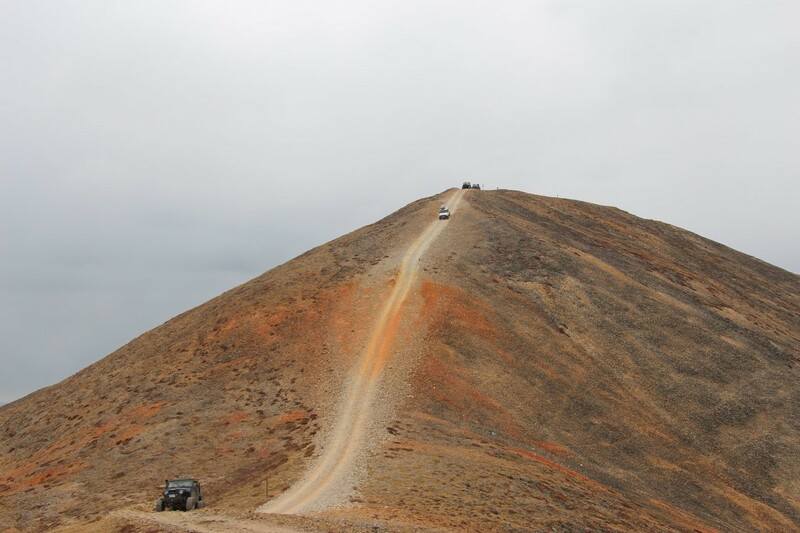 Wonderful trip over Red Cone! It had been over 15 years since I last drove this trail. 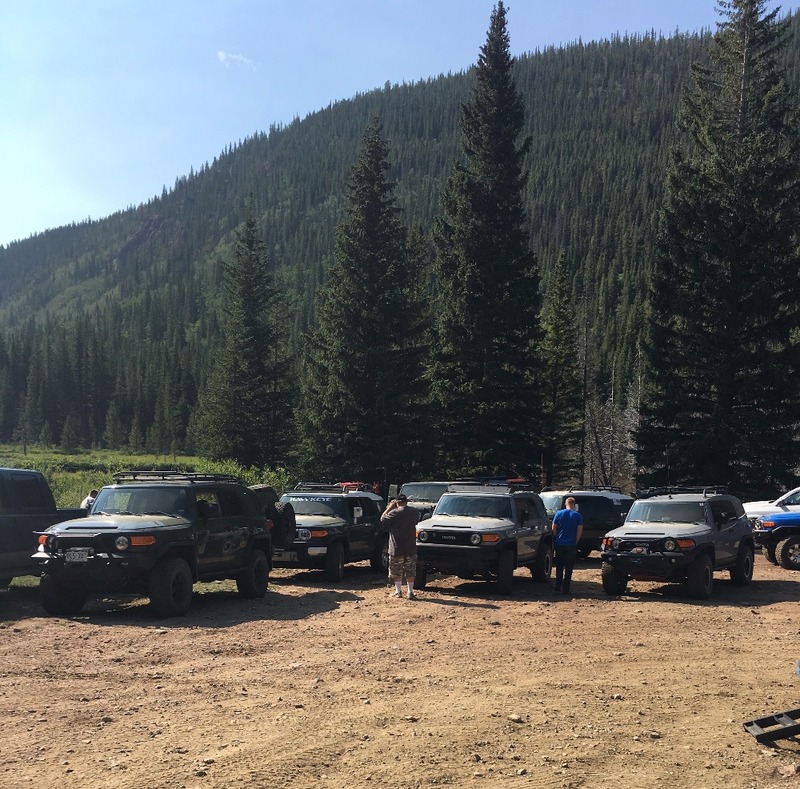 It seems like there has been quite a bit of errosion that was not evident the last time I was here... Our trail run was done with fellow members of the Colorado FJ Cruiser club. There were about 16 rigs on our run. We always like doing runs with this group as everyone is patient and helpful on some of the difficult portions of this trail. The views up top of Red Cone are amazing to say the least. This is one of my favorite trails in Colorado. I strongly recommend! The plan was to hit Red Cone for sunrise and then continue on to Webster Pass to Radical Hill. From Radical Hill we would take Deer Creek to Saint John then finishing on North Fork Swan River leading us back down to Breckenridge. Starting at 4:30 am we were able to be on Red Cone for sunrise and beat all the crowds for the remainder of the trails. 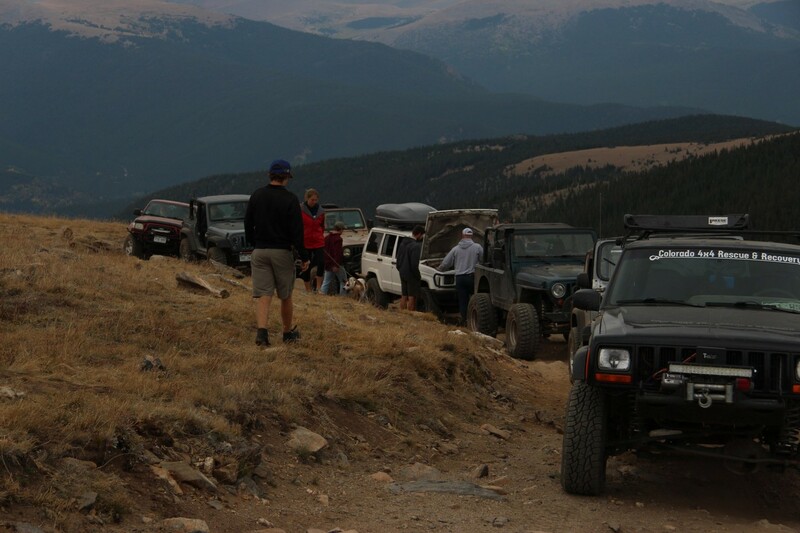 Thanks to the hardworking folks from Mile-Hi Jeep Club, Red Cone will officially open for the season today. This past weekend was a work weekend spent installing new signage, removing tree debris, picking up trash, and clearing snow. Please note that you have to exit via Webster Pass into Montezuma. Webster is not yet clear to return back to 285. The seasonal gate on Red Cone is closed for the season. 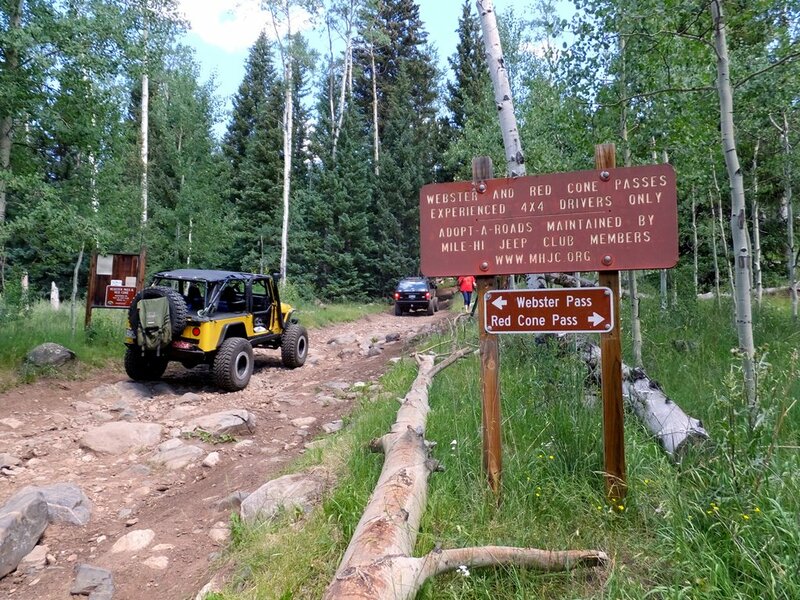 The trail is adopted by the Mile-Hi Jeep Club and anticipates the opening to be the weekend before 4th of July. Great trail, heading up through the trees and then above the tree line, to s steep climb and steeper decent on the other side of the Red Cone. A fall day with lots of colors in the trees and likely the one of the last weekends the trail will be open this year. Continue on to Radical Hill for a little more challenge with off camber short section of shelf road and a narrow area with just enough room for a Jeep to pass. 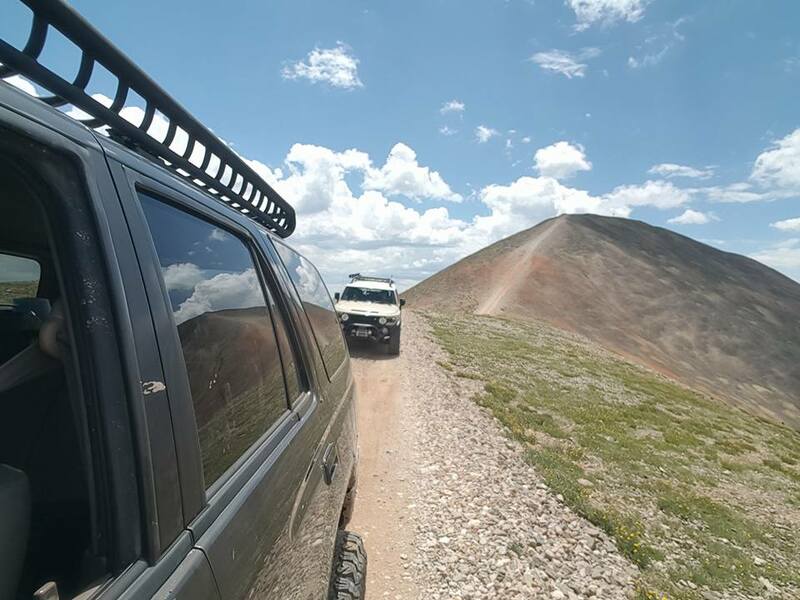 Decided to celebrate July 4th with a quick run over Red Cone Pass. We left town around 7:30 AM to hit the trailhead just about 8:45. Brought the dogs and the ladies to enjoy the views. Hall Valley Campground was packed, and Webster Pass was still closed. As we got to the summit it was evident why. The cornice at the top of Webster (very last switchback) was still about 30' deep. Red Cone Pass was dry and had some recent trimming done, making for a very easy accent to the top. We didn't encounter any other people on Red Cone until reaching the junction of Webster and Red Cone, where we found a lone mountain biker. 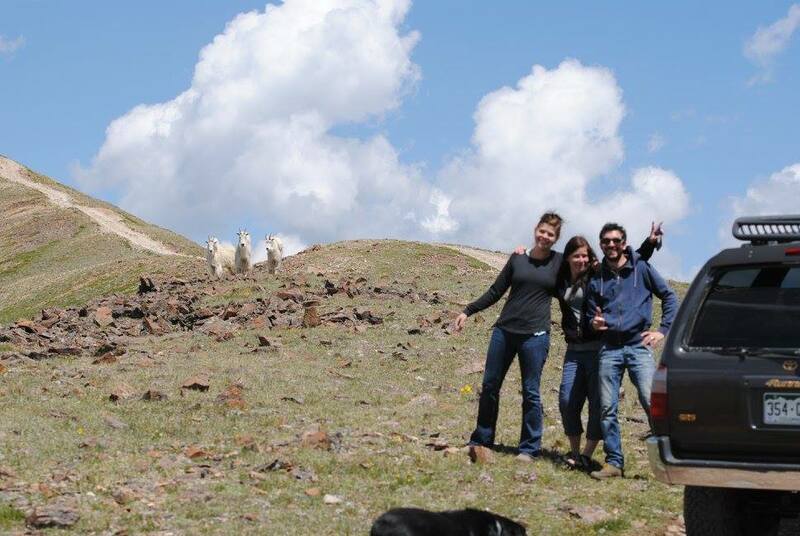 We ate lunch on the summit of red cone where we had the pleasure of seeing 3 mountain goats that were curious what we were doing but not so interested in my dogs. I was amazed at how mellow the decent from the top was. We went down the Montezuma side where the river crossing was around 30" at the deepest point. A young group of campers approached at the crossing and asked if we had and jumper cables. We landed a quick hand to get this groups up and running again. It was around 2:00 when we made it to Montezuma to air up.